Justice League is just a few weeks away when we will all finally be able to see all of our favorite DC comic book characters come together to combat against Steppenwolf and all his Parademons. With that, the marketing is heating up as we inch closer to the November 17 release date! I absolutely adore this poster. It’s clearly inspired by drawings only made for comic books. With the tagline “Stronger Together In IMAX,” the team appears to be ready for battle as they are all charging toward an oncoming enemy. The poster has a very rich color palette which goes over well with the teams costumes. With the exception of #Batman and #Cyborg, the poster showcases a few of the Justice League’s weapons that most of them are known for. #WonderWoman is seen holding her shield along with the Sword of Athena, Aquaman is grasping his Trident, and the Flash’s lightning bolts demonstrates the characters fast speed. The top of the poster also uses the tagline “You Can’t Save The World Alone” which was first used in the Alex Ross inspired poster that debuted at this years #SDCC. 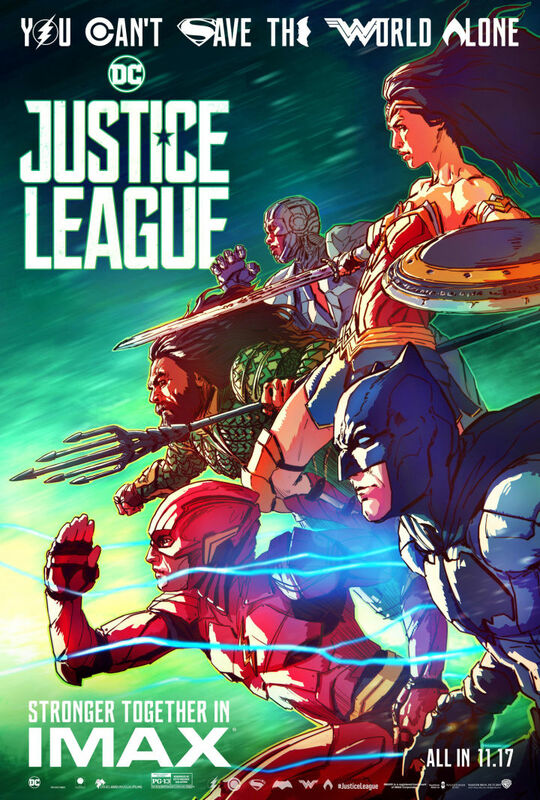 This is perhaps my favorite Justice League poster released thus far. The Fandango poster has a similar comic book style feel to the IMAX poster, however this one instead features the actors faces with a picturesque tone to their appearances. This color scheme makes this poster stand out, but the real star here isn’t any of the characters on the outside of the poster. The middle of the picture is where it really matters. You may not have realized it at first glance, but at the very center of the poster gives us a silhouette of Superman. Cleverly hidden right in the center of the poster, the #ManofSteel shines bright while the other heroes are circled around him. This image is indicative of what’s to come in this movie as Superman is of course known for representing Hope. The brightness of the silhouette gives us a clear indication that Superman is returning and has indeed risen from the dead. One thing I’d like to add about Warner Bros. marketing is that they have done a tremendous job by hiding #Superman in nearly all of the advertising. Whether it’d be by the posters, the trailers, or even the TV spots, WB has been smart enough to keep away any spoilers for the Man of Steel’s return. We already know he’s coming back, so it would behoove the marketing team to ruin his appearance. The last trailer we received stylishly gave us Clark Kent in a dream sequence by Lois Lane as she’s reminiscing about her deceased loved one. The team behind the trailer did a great job showing us that #Henry Cavil is in this film but in a much subtle way. The Fandango poster is another fantastic way to give fans hope of Superman’s eventual appearance. The marketing team has just a few more weeks to hold back the reappearance of Superman and I have a feeling they will do just that. What did you think of these two new movie posters? Which one do you like better? Go ahead and sound off in the comment section below!